Living in Ireland, I genuinely think that Spring is my favourite time of year. I love to see the landscapes in their forty shades of green splendour, daffodils blooming at every turn and the fresh crisp mornings offering the promise of sunshine. I would encourage everyone to visit Ireland this Spring and take advantage of the natural beauty and amenities that Ireland has to offer! Ticks all the holiday boxes! Ireland in Spring ticks all the holiday boxes no matter where your interests lie. Outdoor enthusiasts will be amazed at the amount of activities that can be enjoyed. There are hiking and cycling trails, such as the Great Western Greenway, which stretches 42km and is Ireland’s longest off-road, traffic free, walking and cycling trail. There’s the Wild Atlantic Way driving route, on the West Coast of Ireland, which is the most captivating road trip you will ever encounter, with blue flag beaches, harbours and beautiful towns and villages dotted along its route. It’s the ideal destination for water-sport fans. 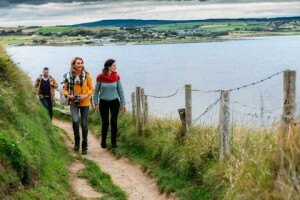 Ireland’s Ancient East is a sign-posted pathway leading you to a wealth of Ireland’s heritage and cultural trails that includes castles, abbeys, prehistoric attractions, lighthouses, a famine ship and even a jail! 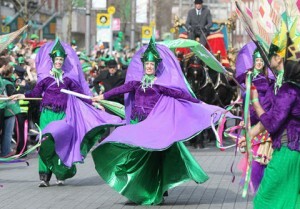 St Patrick’s Day occurs on March 17th and celebrations take place throughout Ireland. Wherever you choose to stay in Ireland, there will be a parade, entertainment and a carnival atmosphere that is family-friendly and lots of fun. From Donegal to Waterford, Galway to Dublin, the craic will be mighty and create holiday memories that will stay with you forever. 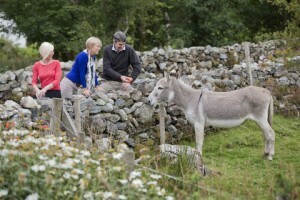 Farmstay holidays are really special in Springtime. It’s the season for new life and there’s lots of activity with lambs, calves, mares and kids making an appearance. 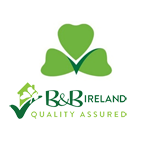 You get to stay with an Irish family and experience the day to day activities that occur on a working farm in a fast and monitored environment. You can take a tour of the farm, help feed the animals, watch the milking process, or if you prefer, just sit back and re-charge your batteries and enjoy home-cooked food in relaxed and comfortable surroundings. Come visit Ireland in the Spring – you won’t regret it! ← Everyone will love a farmstay B&B holiday!